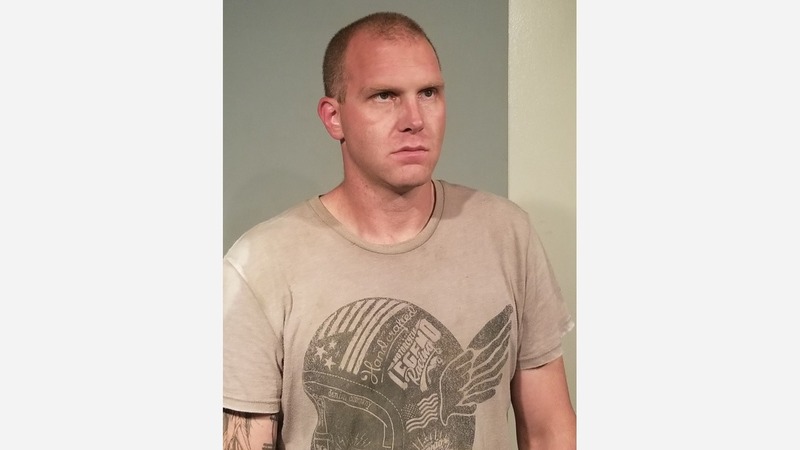 Fresno Police say 36-year-old Jarid Riley Taylor entered Tropical Foods at 1149 West Nielsen Avenue around 7:45 am Tuesday morning and then stole a van that was decorated in ice cream logos all over it. Unbeknownst to Taylor, the van had a GPS system in it and a manager tracked it to the Northwest Policing District where patrol officers located the vehicle in transit at Marks and Dakota Avenues. Officers made a traffic stop on the van and Taylor pulled over in an industrial area in the 3200 block of North Marks Avenue. As officers approached the van on foot, Taylor sped away at a high rate of speed. Officers pursued the van for a short distance into a large lot for big rig repair just off Weber Avenue. Once in the lot, Taylor abandoned the van and walked away on foot, blending in with other employees working at the facility. The first officer arriving at the van started to ask the lot employees where the driver of the van went. At that time, Taylor feigned he was one of the employees and pointed telling the officer the suspect ran in a particular direction. As two other involved officers arrived at the van, they realized that Taylor was in fact the suspect and not an employee working at the business. The officers tried to detain Taylor and he ran westbound through the lot but was quickly apprehended by officers. Police charged Taylor with the following: burglary, auto theft, evading a peace officer (felony section), and being an unlicensed driver. Once Taylor was searched, officers located a SIM card in his possession that belonged to Tropical Foods. The stolen van had a dash camera and shortly after Taylor stole the van he removed the SIM card to the dash camera in order to disable it so he could not be tracked. Thus, Taylor was additionally charged with possession of stolen property and he was also arrested on an outstanding felony warrant for auto theft from the State of Oklahoma. Taylor will be booked at the Fresno County Jail.